Chicago – Irrespective of history of cardiovascular (CV) disease, a glucose-lowering agent has demonstrated protection against heart failure in patients with type 2 diabetes mellitus (T2DM). The landmark trial, presented as a late breaker at this year’s AHA annual meeting, is the latest of the FDA-mandated CV safety studies conducted with sodium glucose co-transporter-2 (SGLT2) inhibitors. The most recent trial is distinguished from previous studies by enrollment of a large primary prevention cohort. 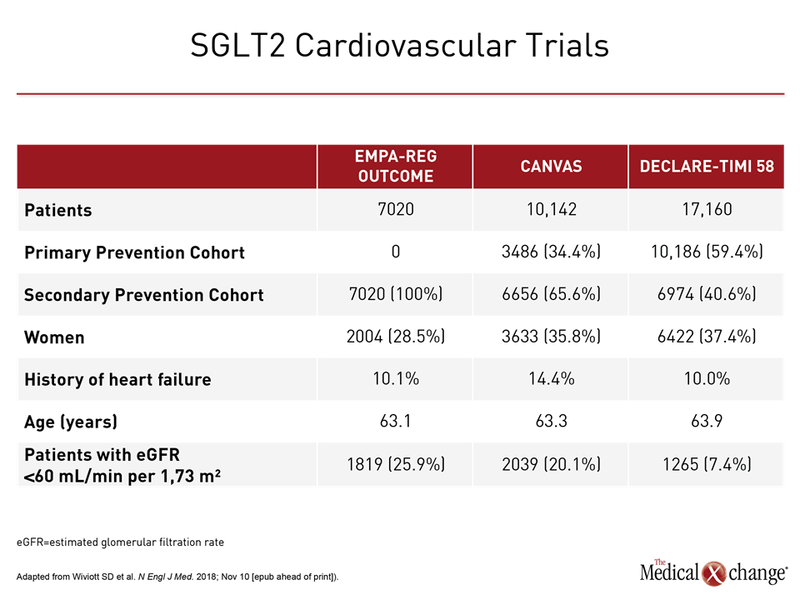 While it reinforces the CV safety observed in the two previous multinational SGLT2 CV trials, significant protection was demonstrated against heart failure, a major source of morbidity in T2DM, providing an even firmer rationale for employing SGLT2 inhibitors in front-line treatment. In this third and latest trial to associate an SGLT2 inhibitor with protection from CV disease, almost 60% of the 17,160 patients had CV risk factors but no CV disease at enrolment. Called, DECLARE-TIMI 58, the CV outcomes trial (CVOT) associated the SGLT2 inhibitor dapagliflozin with a 17% reduction (P=0.005) in the risk of CV death or heart failure after a median of 4.2 years of follow up. The results simultaneously published in the New England Journal of Medicine (Wiviott SD et al. 2018; Nov 10 [epub ahead of print]), are considered immediately relevant for managing risk in T2DM patients. “Heart failure has been consistently shown to be one of the most common, if not the most common, complication in patients with diabetes,” reported Dr. Jared Butler, Chairman, Department of Medicine, University of Mississippi, Jackson, who was invited by the AHA to put DECLARE results in perspective. In the context of previous SGLT2 inhibitor CV safety studies, he said results of DECLARE-TIMI 58 emphasize the role of dapagliflozin and potentially other inhibitors for reducing risk of T2DM complications that are most relevant to patients without established atherosclerotic CV disease (ASCVD). In DECLARE-TIMI 58, which is the largest of the SGLT2 inhibitor CV safety studies yet conducted, 10,186 (59.4%) of the more than 17,000 enrolled only had risk factors for atherosclerotic CV disease (ASCVD). In contrast, ASCVD was an entry criterion for the 7,020-patient EMPA-REG OUTCOME trial. In the 10,142-patient CANVAS trial, which evaluated canagliflozin, nearly two thirds (64.2%) had established ASCVD (Table 1). The enrollment of patients with pre-existing CV disease in EMPA-REG OUTCOME, the first of these studies to be completed, reflected the objective of confirming that these agents do not increase risk of CV events in a vulnerable population. However, with the abundant evidence of CV safety that the two CVOT trials have now generated, attention has turned to establishing CV protection. “Diabetes patients with multiple risk factors but without known CV disease are the largest group of patients we see in the community,” said Dr. Butler, emphasizing the importance of DECLARE-TIMI 58 data in evaluating how SGLT2 inhibitor therapies affect primary CV prevention. In DECLARE-TIMI 58, patients with multiple risk factors for CV disease or who had pre-existing CV disease were randomized to 10 mg once daily dapagliflozin or placebo on top of anti-diabetic medicines employed to maintain glycemic control. 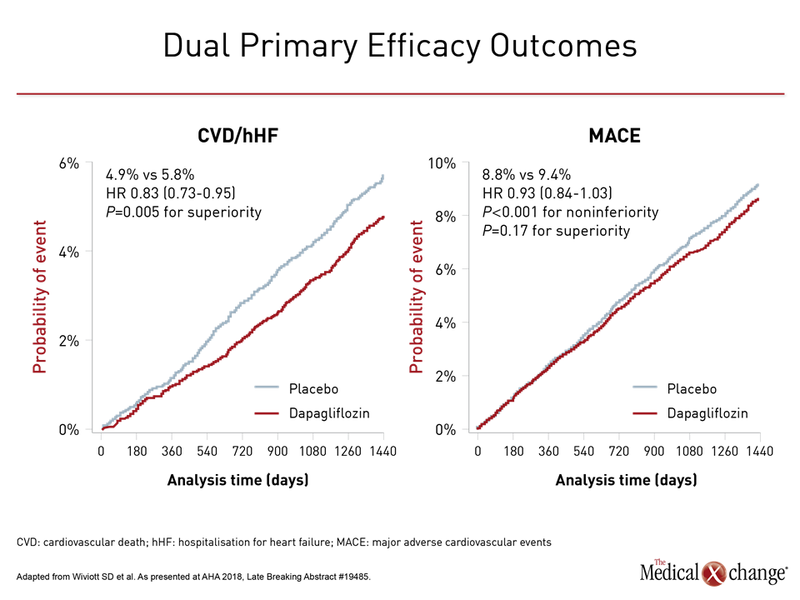 Like the two preceding CV safety trials, DECLARE-TIMI 58 first fulfilled a regulatory mandate to show non-inferiority to placebo for the endpoint of major adverse CV events (MACE). It was then designed to evaluate two co-primary efficacy endpoints. One was a MACE composite of CV death, myocardial infarction (MI), and stroke. The other was CV death or hospitalization for heart failure (Fig. 1). Adverse events in the two arms were also compared. In the large overall population in DECLARE-TIMI 58, the reduction in MACE (8.8% vs. 9.4%) fell short of significance, but Dr. Butler explained that the data generated by this study remain consistent with the MACE benefit observed in the previous two trials. In the secondary prevention subgroup of DECLARE-TIMI 58, the MACE risk reduction was about the same as that reported in EMPA-REG OUTCOME and CANVAS, according to Dr. Butler, citing a meta-analysis published in conjunction with release of DECLARE-TIMI 58 data (Zelniker TA et al. Lancet 2018; November 10 [epub ahead of print]). In this meta-analysis, primary and secondary prevention cohorts were evaluated separately and together. For the secondary prevention cohort in DECLARE-TIMI 58, the hazard ratio (HR) for MACE for those treated with dapagliflozin relative to placebo was 0.90. This was comparable to that for secondary prevention with the other two SGLT2 inhibitors in their respective trials, according to Dr. Butler. For example, the MACE HR for the SGLT2 inhibitor relative to placebo in the EMPA-REG OUTCOME trial was 0.86. Confidence intervals for EMPA-REG OUTCOME and DECLARE-TIMI 58 overlapped. Conversely, there was no significant risk reduction observed for MACE in the primary prevention cohorts of DECLARE-TIMI 58, CANVAS, or when both sets of data were combined (Fig. 2). “The reduction in MACE [with SGLT2 inhibitors] appears to be confined to patients with established ASCVD,” said Dr. Butler, echoing the conclusion of the authors of the meta-analysis. They characterized the reduction in MACE as “moderate” even among those with pre-existing CV disease. In contrast, the reduction in the second co-primary endpoint of CV death and hospitalization for heart failure in DECLARE-TIMI 58 “was consistent across multiple subgroups, including those with risk factors only and those with ASCVD,” reported the principal investigator Dr. Stephen D. Wiviott, Brigham and Women’s Hospital, Harvard Medical School, Boston. There was also protection in those with or without a history of heart failure and those with or without renal impairment. In a detailed analysis of the components of this endpoint, the reductions in CV death, like the 0.4% reduction in the absolute risk in death from any cause (6.2% vs. 6.6%; HR 0.93), was not statistically significant, but the 27% reduction in hospitalization from heart failure did have 95% confidence intervals that were well within the bounds of statistical significance (HR 0.73, 95% CI 0.61, 0.88). The same phenomenon was observed in the meta-analysis. Among secondary prevention patients, the reduction in the endpoint of CV death and hospitalization for heart failure was 24% (HR 0.76; 95% CI 0.69, 0.85) for the three studies combined and similar when the studies were assessed individually. In patients with risk factors only, the overall risk reduction was 16% (HR 0.84; 95% CI 0.68, 1.01) with similar reductions for the two SGLT2 inhibitor trials that enrolled primary prevention cohorts. These reductions were characterized as “robust” by the authors of the meta-analysis. In addition, an exploratory analysis of DECLARE-TIMI 58 associated dapagliflozin with a 24% reduction (95% CI 0.68, 0.87) in the risk of a composite outcome of renal events that included progressive renal impairment, end-stage renal disease, or death from a renal cause. This major reduction in renal events was observed even though patients in DECLARE-TIMI 58 had relatively little renal impairment at baseline. While the proportion of patients with eGFR <60 mL/min per 1.73 m2 was just 7.4% in DECLARE-TIMI 58, it was 20.1% in CANVAS and 25.9% in EMPA-REG OUTCOME. Dr. Butler stressed that protection from progressive renal disease in DECLARE-TIMI 58 after only four years of median follow up is an important finding for a study in which nearly 60% of participants entered the study with CV risk factors only. “In CV risk management of patients with T2DM, it becomes imperative to also consider risk for heart failure and chronic kidney disease,” said Dr. Butler, putting these findings into perspective. He stressed that progressive renal disease and heart failure are important, common, and related complications of T2DM. Both are part of a pathophysiology that leads toward and predicts terminal MACE events. As a result, protection against heart failure and renal impairments are critical targets of risk management in T2DM, whether or not patients have a history of CV disease. “Any quality improvement initiative for management of patients with diabetes that does not include [protection against] heart failure is likely to fall short,” Dr. Butler said. Reiterating that dapagliflozin prevented CV events “in a broad range of patients with T2DM,” Dr. Wiviott reported that the protection was achieved with a very favorable safety profile. 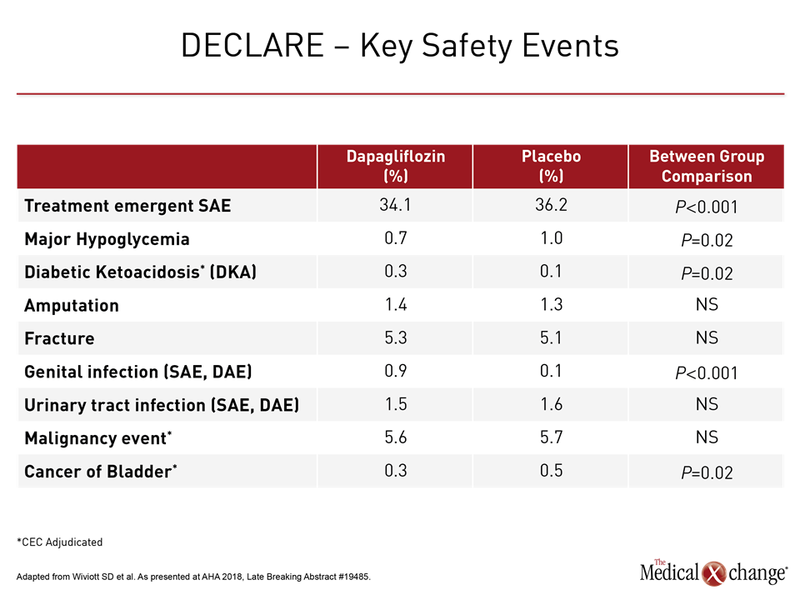 The rate of serious adverse events was significantly lower in the dapagliflozin than placebo groups (34.1% vs. 36.2%; P<0.001) primarily due to a lower rate of kidney injury and hypoglycemic events. Unlike earlier SGLT2 trials, including CANVAS, there was no difference in risk of amputations (1.4% vs. 1.3%; P=0.02), bone fractures (5.3% vs. 5.1%; P=0.59) or cancers of any kind (5.6 % vs. 5.7%; P=0.83) observed for dapagliflozin relative to placebo in DECLARE-TIMI 58. The only side effects significantly more common on the SGLT2 inhibitor were genital infection (0.9% vs. 0.1%; P<0.001) and diabetic ketoacidosis (0.3% vs. 0.1%; P=0.02), but these occurred in less than 1% of patients in either group (Table 2). The CV safety studies with the SGLT2 inhibitors as well as other anti-diabetic agents were mandated by the FDA based on the critical importance of avoiding any exacerbation of CV risk in patients with T2DM. Although MACE was considered the best endpoint to demonstrate CV safety, Dr. Butler emphasized that it is not the most relevant for evaluating benefits in T2DM patients, particularly at early stages of disease. “Regardless of what endpoint was chosen for these trials based on guidance from regulatory agencies, all CV complications are important to the patient,” Dr. Butler said. He noted that although hospitalization for heart failure is not uniformly included among endpoints when evaluating impact of risk reduction strategies on CV events, it is a highly relevant outcome in T2DM. One reason is that T2DM patients in heart failure “are at an extraordinarily increased risk of mortality.” Although lipid lowering and blood pressure control have little or no effect on prevention of heart failure, according to Dr. Butler, the protection associated with dapagliflozin even in the absence of CV disease is a paradigm shift. “For patients similar to the ones enrolled in these trials, SGLT2 inhibitors should be used for incident heart failure risk reduction irrespective of the effect on MACE outcomes,” Dr. Butler said. 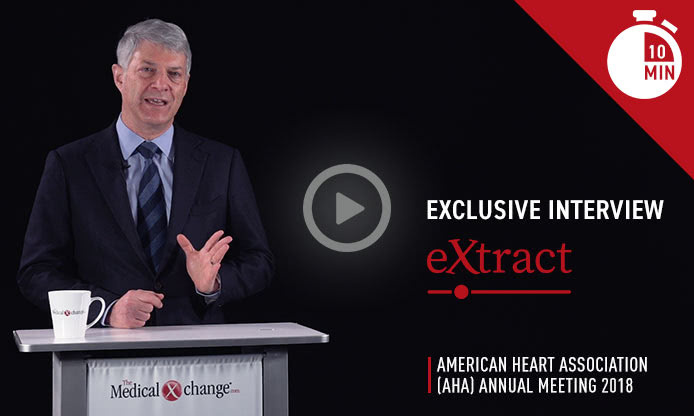 He is among several experts at the AHA who concluded that SGLT2 inhibitors should be considered among first-line therapies for glycemic control because of this evidence of CV risk benefit. The third and largest of the SGLT2 inhibitor CV safety trials associated dapagliflozin with a substantial reduction in CV mortality and hospitalization for heart failure whether T2DM patients have a history of atherosclerotic CV disease or only CV risk factors. This trial, DECLARE-TIMI 58, is the largest of the SGLT2 safety studies so far conducted and included more than 10,000 patients in a primary prevention cohort. 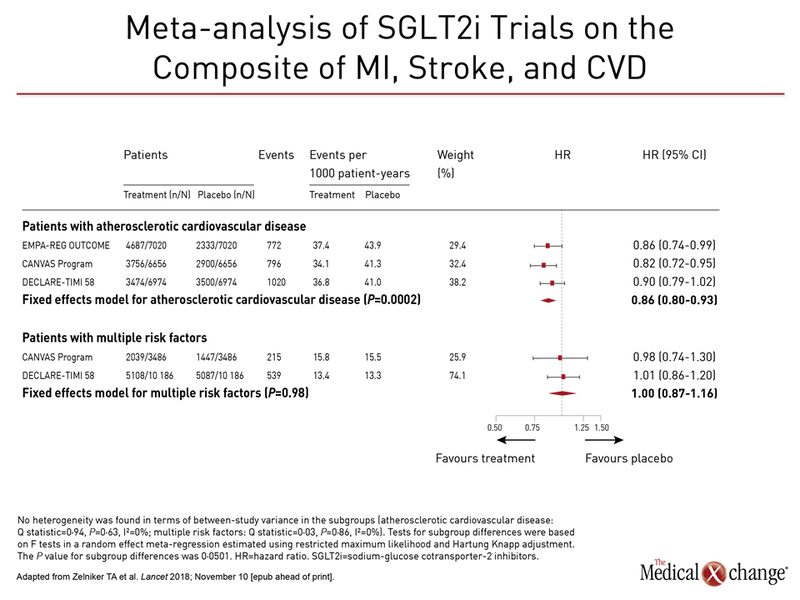 The protection against heart failure, which is one of the most common complications of T2DM, suggests SGLT2 inhibitors have an important role beyond glycemic controls in T2DM treatment.